There’s a certain road that they say is paved with good intentions. Hint: it’s not the road to heaven. According to a well-known chassidic adage, “the deed is the essential thing.” We are, to a great extent, defined by our actions. Or, to put it a bit less comfortably, we might just as easily be defined by our lack of action. I frequently lament the things I have not yet accomplished. It can be sobering to periodically take stock of my goals and see how much I have actually done. While such self-appraisal is a noble and effective aspect of any plan, unfortunately, it can also easily lead to regrets and recriminations, which in turn can become obstacles to healthy spiritual growth. When I focus on what is wrong rather than what is right, it diminishes my ability to succeed. A confident attitude empowers us to improve productivity and efficiency as we face life’s challenges. When I focus on what is wrong rather than what is right, it diminishes my ability to succeedI was recently inspired by a story I heard from Rabbi Yossi New of Atlanta, Georgia. He had received a phone call from an executive at the central office of the Coca-Cola Company, requesting an appointment. When “Mister Coke” arrived with his entourage, he told Rabbi New that he wanted to understand the secret of corporate Chabad’s success. When Coca-Cola makes a small change in a product or in its marketing strategy, the executive explained, it takes years to test, evaluate, refine and implement the change in the global marketplace. In contrast, when the Lubavitcher Rebbe initiated brand-new campaigns, the campaigns were enthusiastically deployed throughout the world in a matter of days. The Coca-Cola representative had come to decipher the secret to Chabad’s efficiency. Certainly—to give credit where credit is due—the answer to Mr. Coke’s question begins with an acknowledgment of the spiritual dimension: as emissaries of an extraordinarily holy man, the Rebbe’s workers are empowered from Above. Similarly, through their connection with the Rebbe and his inspiring leadership, thousands of otherwise average men and women have become empowered with unbounded energy, determination, leadership and creativity. They face challenges far beyond their powers as isolated individuals. But as connected emissaries, in their various Chabad centers, they succeed all over the world. But it’s not just miraculous. It also makes perfect sense. If we analyze the dynamics of how to implement empowerment, all of us can connect with G‑d’s will, render ourselves apt candidates for help from Above, and become experts at getting it done. Our first thoughts of the day are powerful. The traditional morning prayer, “Modeh Ani,” is said while we are still in bed, acknowledging G‑d and thanking Him for restoring our soul. After beginning the day with gratitude and connection, we can take a moment to ask for guidance in choosing constructive, purposeful thoughts and actions, steering clear of selfishness, resentment or envy. Our first thoughts of the day are powerfulSimilarly, bedtime is one of the few occasions when it is helpful to look back, making a cheshbon ha-nefesh, a frank assessment of our day. Take note of shortcomings. Then we can forgive ourselves and others, and resolve to make amends where needed. With the day bracketed between morning and evening introspection, we can now look more closely at our actions and motivations during the course of the day. At first glance our habits may seem random, but they are not; they invariably stem from our core values. We all have priorities. Some of us spend hours shopping to save a few dollars, because frugality is one of our core values. Some of us prefer to spend hours communicating with people who need assistance, because compassion is important to us. For many of us, careful observance of mitzvot, including regular attendance at synagogue and Jewish functions, is a value. For others, time spent sweating at the gym or dehydrating vegetables may be more important. Just once, take half an hour from your busy schedule to make a list of your governing values. Refine the list, and prioritize it. Which guiding principles are most important to you? Consider: gratitude, faith, freedom, loyalty, generosity, patience, beauty, professionalism, compassion, health, quality, courage, equanimity, creativity, community, spirituality, respect, family, humor, responsibility, integrity and charity. We can easily see the fallacy in his thinking. This parable can help us understand the importance of taking the time to step back and gain perspective on our lives—a crucial step in effective time management. Once you identify your governing values, you can begin to set goals. Corporate coach Stephen Covey calls goals “Dreams with a Deadline.” To make an effective goal plan, you need to do four things: Write it down, give it a timeframe, break it into manageable chunks, and commit. As a life coach, I often use the acronym S.M.A.R.T. goals – Specific, Measurable, Attainable, Realistic and Time-bound. Chassidim regularly make hachlatos—resolutions. The Rebbe encouraged people to make hachlatos on their birthdays and on auspicious days in the Jewish calendar. It’s good to anchor these commitments by discussing them at meaningful gatherings, where one feels the emotional support—and hence the added strength—that comes from being a part of a group. Despite establishing our core values and concrete goals, our determination to get it done may still come up against other aspects of our busy day. Many of us find ourselves juggling roles like a circus clown spinning plates in the air, and at times the roles can conflict. At this moment, am I a teacher, a student, a parent, a spouse? Am I a mentor, a disciple, a grandparent, a friend? And from a broader perspective: to what extent should I see myself as an individual with unique gifts and dreams, and to what extent must I temper my individuality in accordance with my duties and loyalties to the groups to which I belong? Once we have clarified our values, roles and goals, we can begin to planIt’s important to do something in service of each of our roles every week. We can put these activities on our calendars in the same non-negotiable way we schedule dentist appointments. Once we have clarified our values, roles and goals, we can begin to plan. In general, planning is best accomplished first on a long-range basis, then in progressively shorter timeframes. Establish a regular Sunday planning session that sets up the week in accordance with values, roles and goals, and then use that as the basis upon which to schedule activities day by day. That way, we can be sure to find appropriate time to address all our passions, responsibilities, and relationships. If we simply plan daily, just paying attention to the immediate chores at hand, we might cross off numerous activities yet never get around to the real goals, the bigger picture. Carve out time for your physical and emotional needs as well. 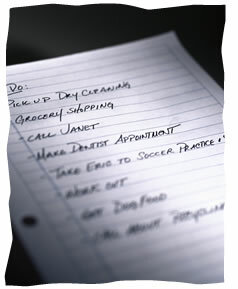 Write them into your weekly schedule, or they will be overshadowed by your e-mail, grocery shopping and banking. We are spiritual, intellectual, emotional, physical creatures who need to eat, pray and love. Take the time to eat well, exercise, and find healthy outlets for emotional relaxation. In my coaching career, I have found that the four letter word “c‑a‑n’‑t” is so perceptually debilitating that many capable people who really can simply don’t! The litany of excuses is long and familiar. When facing these roadblocks, reexamine them, find a coach, a mashpia, a loving cheerleader to spur you on, or take another route. Remember: any doubt that arises during the course of the day can dampen the spiritual fire, cool the enthusiasm, and sap the energy it takes to realize your goals. On the Lubavitcher Rebbe’s seventieth birthday in 1972, he shared a vision of Chabad Houses popping up all over the world like supermarkets. Even some chassidim were uncomfortable with this dream, but the Rebbe was focused, certain and unflinching. His resolve goes back to that pivotal time in history when the Alter Rebbe (the founder of Chabad) and Napoleon were contemporaries and adversaries—a seemingly powerless old rabbi in a ruthlessly anti-Semitic world, versus the ruler of a vast empire. Today, of course, Chabad centers flourish around the globe in unprecedented, ever-expanding numbers. And what has become of Napoleon? He’s been reduced to a cream puff! Frumma Rosenberg-Gottlieb is an educator, spiritual mentor, speaker and Certified Life Coach. Simcha Gottlieb is a writer, teacher, and practitioner of Acupuncture and Herbal Medicine. This article is excerpted and adapted from their forthcoming book, entitled Wholly, Wholly, Wholly. working mother It's a refresher for me to read your article.